Working on for years on so many multimedia projects the most interesting were those that were interactive to delve further into this investigation I visited NYU ITP and it was nothing short of incredible. In 2004 while still an Athena Fellow with Mark DiSuvero I applied to NYU ITP MPS program and was granted a fellowship and for a while I was active in both fellowships. 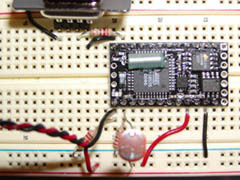 The beauty of micro control (BX-24, Aurduino, Pic or any controller) is that once the microchip is programmed it can be dedicated to a multiplicity of functions as well has both analogue and digital outputs. 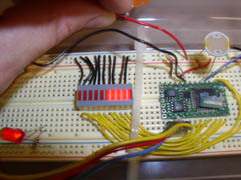 The microcontroller having a flash memory can be programmed a multiplicity of times and the chip in puts and out puts can be easily reconfigured or altered. It’s pretty amazing. 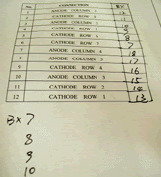 This page is a simple example of that using a BX-24. As a result of my attending NYU ITP MPS fellowship I understand the basics of using and programming a microcontroller, learned to build better circuits, have a savvy working knowledge of how to properly conduct research for building an interactive project. As well I have gained UI Physical Computing knowledge in combining hand built circuits, via serial communication interacting with software (Dirextor Mx) or MaxMSP and or thru hardware (hand constructed) or commercial (such as a midi) that I have utilized to create interactive projects since. 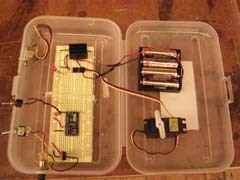 I built a video controller using Director MX and a BX-24. Once constructed, I could move the video in any direction based on altering the code in Director MX. In Director MX I redefined a sprite to be a movie rather than an object (on the stage). 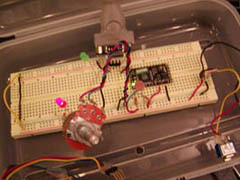 The potentiometer via serial communication gave me the ability to control where the movie moved on the screen (via serial communication) and a programmed BX-24. Demo of the controller moving video. This was a basic exercise in trying to understand how serial communication works as well as how to access ASCII by limiting a resistor. Normally the range of any resistor runs from 0 to 1024. 1024 was divided to obtain the alphabet. When I interacted with the photo sensor I was able to obtain the range in the alphabet as pictured. Photo sensor output via ASCII . I worked with Yan Yan Pei and Steve Oh on this project. Etiquette book responds to the viewer as they enter a room (activated by an infrared sensor) and responded by the cover shaking and screaming. When the viewer lifted the book cover there was a strobe flash. All functions of the motor, scream and infrared sensor are micro controlled by the B-X24. When approached the book is activated. I worked with Anne Clark and Yan Yan Pei on this project. Once we built the circuit and figured out the coding (with the gracious help of Josh Nimoy) we started sending patterns across the face of the LCD panel both vertically and horizontally (by adjusting two potentiometers). This is a common servomotor used in small devices. This demonstrates how altering the programming of the BX-24 can alter the degree of rotation as well the direction (clockwise and counter clockwise). I was surprised the amount of torque the servomotor hand and how robust it was compared to a high current motor. My interest in the motor lent itself to Etiquette Book. Both photo sensor and a potentiometer are analogue resistors. The BX-24 was programmed so that when either turning the potentiometer or covering the photo sensor would increase of amount of bars lit on the LCD panel. As well is displayed an analogue to digital conversion. 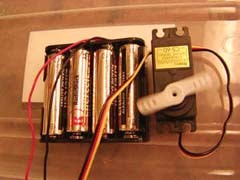 A to C conversion circuit. The BX-24 has 24 pins 3 are dedicated to positive, negative voltage and one to reset. 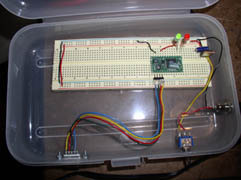 The other 18 pins are active control pins once the BX- 24 is programmed it can perform a host of functions. Most of which are based in simple on/off and time based functions (such as sending a command to pin 5 for .5 sec) resistors as well can enhance that. Strobe was much faster than pictured.